trying to grab some happy: I don't think I can do it!!! I love my daily Starbucks. I get a Starbucks every.single.day. And I don't drink coffee. I get a soy chai. My XSIL/friend mentioned her weekly food budget, its $25. A few days later, it dawned on me that's about what I spend weekly on Starbucks. That would pay for a nice little getaway. I could go visit Patricia and Emma for instance. Also, if I stopped drinking a daily Starbucks, I would save approximately 54,000 calories/year. A little more if I exclusively drank soy chai lattes. Since a pound of fat = approximately 3,500 calories, I could potentially lose 15 pounds/year. So, for two reasons, I should give up my daily Starbucks. The thing is to me, a Starbucks is more than a really expensive guilty pleasure. I know, those baristas get paid to practice great customer service. But they are damn good at it. I feel like we have a "relationship". its really nice when your name is remembered. When sometimes your drink is made by the time you walk in the door. Or when you get a happy face drawn on your cup. So, I don't think I can do it, you know...give up my daily Starbucks. Your post makes me smile! I would feel that way too! It's the little things that make our day! You go with your daily Starbucks girl! So your new e-mail is Super.Linda@stbx.com ???? Made me smile on my first day of vacation!! Thanks!! 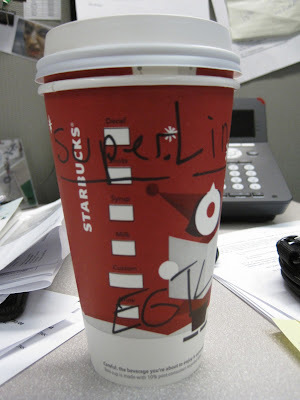 This is an amazing post...seriously...your love of Starbucks shines through!!! Ha! And we're going to have to figure out a getaway to get together...but I agree, getting Starbucks daily is more than just getting a drink...you are so amazing with words, my friend, Linda! I know, it's a lot of money you spend and it made my jaw drop too, but then again: it's not much to pay for HAPPINESS!!! Be glad you can afford it, and keep on drinking your daily portion of joy! I love starbucks, too, but I am a coffee drinker!!!!!! !